Chermoula is a marinade for fish and the foundation of a number of Moroccan fish dishes, including a baked fish tagine, fried sardines stuffed with chermoula and fish tagine mqualli. Chermoula can also be used to marinate chicken or shellfish. When using as a marinade, you will need to add a little bit of liquid to thin it out; the recipe here creates a thicker sauce which is closer to a relish, ideal for stuffing fried fish. This classic Chermoula recipe is quick and easy to prepare. It's similar to a pesto but without the nuts and cheese. It calls for fresh cilantro, here you want to use only the leaves and small stems; the large stems should be discarded. 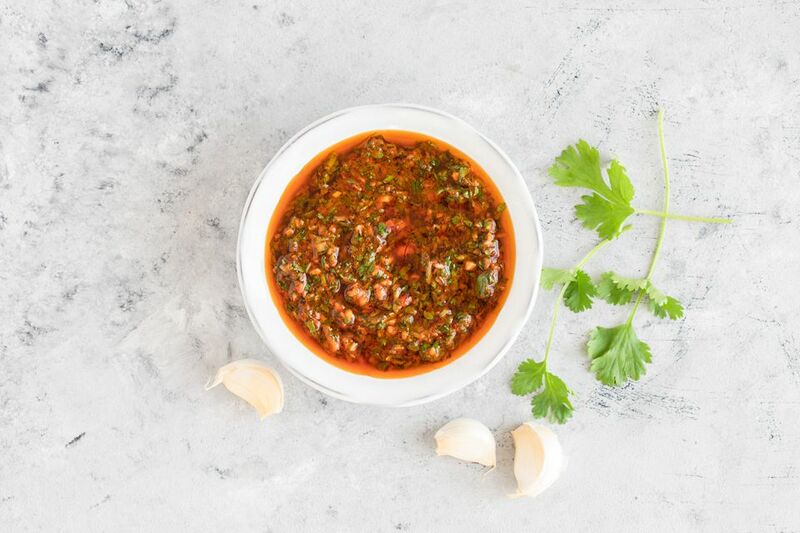 Chermoula is made in Morocco, Algeria, Lybia, and Tunisia. Each country has a slightly different method to prepare it, but the results are very similar in taste. Feel free to adjust the cayenne pepper to your preference. This recipe makes enough marinade for about 4 1/2 pounds (2 kilograms) of fish. You can also use it to top vegetables like cauliflower or winter squash, or stir a little into your couscous. The chermoula is now ready to use. When marinating fish or chicken, you might want to add a little more oil or a tablespoon or two of water to thin the marinade, so it's easier to distribute over the fish. Leave the chermoula thick if using as a stuffing for fried fish or if you intend to use it as a relish. Saffron is the most expensive spice on earth. It's actually worth more in weight than gold is. It comes from the dried stigma of the Crocus Sativus Linneaus, a type of Iris, and must be hand-picked from the flowers. Sourcing saffron threads can be difficult, but they are well worth the time and money. If you choose to substitute saffron powder, make sure to check the ingredient label to ensure that the powder is actually made of saffron. It's not uncommon for the saffron powder to consist primarily of paprika, turmeric, or other spices. If you can't find pure saffron powder, opt for the one that has saffron listed as the first ingredient. Also, note that if you do choose saffron powder, you will lose the visual element of the seeing the threads in the marinade, which may or may not matter to you.